The Mighty Mule FM350 Medium Duty Single Gate Opener Kit. Mighty Mule 350 is Designed to be used on residential properties with gates including farm tubing, steel, aluminum, wood, and chain link, along with many other gate types. Working either set on the left or right this gate opener is sold to be used in the standard pull-to-open operation. By adding the push-to-open bracket accessory (not included) the FM350 Medium Duty Single Gate Opener has the ability to push the gate open away from the property using a PTO bracket (not included) while keeping the gate opener arms safely inside the property. The Mighty Mule FM350 E-Z Gate Opener is designed for installation on a pull-to-open single leaf gate (gates that open into the property). By purchasing an accessory bracket (FM148), the Mighty Mule E-Z Gate Opener can accommodate a push-to-open single leaf gate (gates that open out from the property). The gate must not exceed 8 feet and 550 pounds or exceed 16 feet and 150 pounds . The Mighty Mule E-Z Gate Opener can be used on vinyl, aluminum, chain link, farm tube, and wrought iron gates. Use on solid (wood) gates is not recommended. Solid surface gates have a high resistance to the wind. If the wind is strong enough, the opener will obstruct and stop. The Mighty Mule 350 E-Z Gate Opener Upgraded from Mighty Mule FM350 features adjustable obstruction sensing. This safety feature makes the gate stop and reverse direction within 2 seconds when it comes in contact with an obstruction. MIN is the factory setting; meaning the gate will exert the minimum force on an obstruction before it stops and reverses direction. The Mighty Mule E-Z Gate Opener also has an adjustable auto-close feature. After the gate reaches the fully open position, it can be set to remain open up to 120 seconds before automatically closing. Pressing the transmitter button at any time after the gate opens fully will cause it to close immediately. OFF is the factory setting; meaning thegate will stay open until you press the transmitter (or keypad, etc.) again. • Low friction screw drive (linear actuator) rated for -5 ºF to +160 ºF (-28 ºC to +71 ºC). 520 inch lb. of torque at 12 V.
• Maximum opening arc of 110º. Approximate opening time (90º): 18 seconds, depending on weight of gate. • The system is powered by a 12 Vdc automotive or marine battery. diode on the control board prevents battery discharge. IMPORTANT: Never use both transformer and solar panel - this will damage the battery and control board. • One (1) blade-style control board fuse is rated for 15 A. NOTE: The transformer should not be directly connected to any battery. Do not replace fuses with higher ampere rated fuses; doing so will void your warranty and may damage your control board. adjusted to accommodate an optional kit for push-to-open gates (see Accessory Catalog). • Control board has temperature compensated circuits. • A circuit on the control board regulates charging. "Sleep draw" is 25 mA; "active draw" is 2 to 5 A. • Auto-memorization of digital transmitter code. • GTO remote-mounted RF receiver tuned to 318 MHz. • Opener length with push-pull tube fully retracted is 371/4", mounting point to mounting point. • Adjustable auto-close timer (OFF to 120 s), and obstruction sensitivity. • Power terminal bock accommodates a transformer or solar panels. • DIP switches simplify setup of gate opener. • Accessory terminal block fully compatible with all Mighty Mule access controls. • Control board allows connection of safety edge sensors and photoelectric sensors. • Audio entrapment alarm sounds if unit encounters an obstruction twice while opening or closing. This gate opener is great for the gate that I have. No problem installing it. 3rd one I've bought. Still love it. Price is right and it gets lots of use and still holds up well. The service that Gate Openers Unlimited provides is outstanding! I ordered on a weekend, had problems with the shipping address and Arthur called first thing Monday morning. Got it all straightened out in less than 5 minutes and had my opener by Friday. The downside is that mighty mule has lost some quality over the years (this is my 3rd opener in 20 years. None of my old remotes or key pads would work with this unit. I've had charging problems limit switch problems and it will not close on its own. GTO (might mule) would not help because the warranty card was in the mail and they had no record of it. They told me to wait a week and call back. 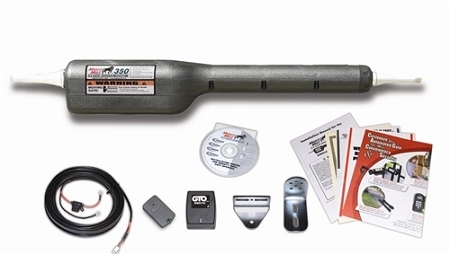 I probably won't purchase anymore GTO products but I will definitely be ordering again from Gate Openers Unlimited !!! 73 y/o female. Lightning had stuck gate and would not open or close. Called company, ordered new gate system. Replaced opener arm and signal receiver myself, with just a short conversation to tech control. Works beautifully, no problems!! Couldn't ask for a better product, installation instructions, and quality. The product worked as advertised. I'm very satisfied with its performance.